"...The US recession is sure to send inflation to zero – just like it didn't in four of the last five recessions..."
WORRIED ABOUT INFLATION...? Oh stop your carping and set an extra place at dinner for the fast-looming recession instead. See, your cost of living can't possibly keep rising now that Europe and the United States are plunging into a credit-led slowdown. Inflation is dead, killed by the slump. The value of money is going to stop sliding, even as interest rates fall. Says who? Says just about everyone. "A US recession is now an even bet as job losses and the housing contraction jeopardize the longest-ever expansion in consumer spending," says Bloomberg News, reporting its latest survey of professional number-crunchers. "The world's largest economy will grow at a 0.5% annual rate from January through March, capping the weakest six months since the last economic slump in 2001, according to the median estimate of 62 economists polled from Jan. 30 to Feb. 7." And your cost of living can NEVER go up during a recession, right...? 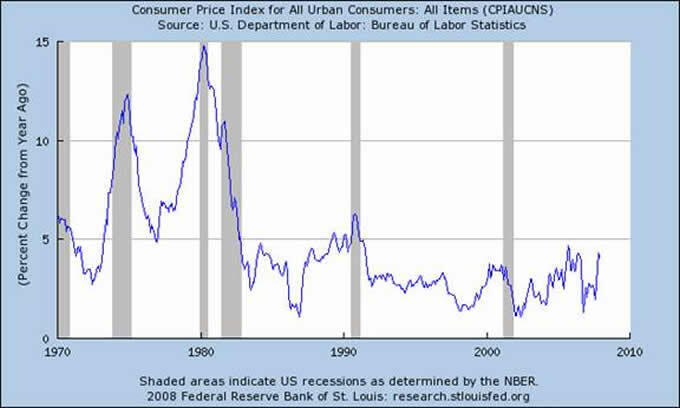 Oh sure, inflation in US consumer prices accelerated by one-half during the recession of 1973-75. It then hit an all-time peak during the short recession of 1980. Inflation went on to beat its previous 30-year average during every month of the 1981-82 recession. (Don't misread that "fall" from 10% to 5% year-on-year; the Dollar's buying power still shrank by almost one-tenth inside 16 months). And the cost of living then spiked higher again when recession next struck in 1991. But this time, well...this time it's just going to be different, okay? Think 2001 rather than the four previous US recessions. And not just in the United States , either. "The Eurozone economy is now clearly slowing down," says Michael Hennigan, founder and editor of Finfacts, the leading financial news site in Ireland . "Oil prices are also off their peak, [so] combined, these factors should act to dampen inflationary pressures in the economy. In particular, it should help prevent excessive wage increases that could endanger price stability." Here in the United Kingdom – the world's fourth or fifth largest economy, depending on how you count China 's boom – growth just slid to 0.5% in the three months ending January, says the National Institute of Economic and Social Research. And that slowdown, the worst rate of growth since 2005, gives the Bank of England "room for further cautious reductions in interest rates," reckons Martin Weale, the NIESR's director in London . "I don't see the risk of inflation being a constraint." Back across the Atlantic , "the economy is rapidly slowing on all fronts, Wal-Mart [is] slashing prices again, and rising unemployment and delinquencies are going to further restrict bank lending," says Mike Shedlock in his Global Economics Analysis blog. "There is simply no way to get inflation out of this mix," Mish concludes. "The Fed Fund rate is headed to 2% or lower, and the 10-year Treasury yield will likely make a new all time low yield. Those shorting Treasury bonds with impunity will have their heads handed to them." Hands up, inflation as properly defined – meaning an increase in the money supply – continues to rise. Growth in the M2 measure "is running at almost a 6% year-on-year," admits David Rosenberg at Merrill Lynch. But "of course it is," he then spits. "Most of [this new money] is situated in non-transaction savings accounts, and these are up almost 8% from a year ago. So transaction balances are falling and precautionary balances are rising – what does that tell you about consumer spending and saving behavior? "This is all, from our lens, very deflationary. Not the other way around." Big picture, even the Euro-crats of the European Central Bank agrees; slower growth will result in lower inflation – even if the ECB did sit on the Eurozone's 4.0% interest rates once more on Thursday. Pressured to repeat the magic words "vigilant on inflation" at the press conference that followed, Jean-Claude Trichet managed instead to send the Euro plunging to a near-three week low by hinting at cheaper money to come. "Some of the menace behind [his] anti-inflation comments in previous months seems to have been softened," as David Brown at Bear Stearns noted to AFX Thomson, "and there appears to be greater stress on the downside risks to growth." Put another way, lower growth – if not recession – will take the heat of prices. Because lower growth means falling demand. And only rising demand can ever push prices higher. Or so everyone says. Which is odd given the facts. "Few empirical regularities in economics are so well documented as the co-movement of money [supply] and inflation," as Mervyn King, now governor at the Bank of England in London , said in a speech of late 2001. And the world's supply of money is surging right now, even as "deflation" hits US housing and stocks. "Over the 30-year horizon 1968-98," King went on back in 2001, "the correlation coefficient between the growth rates of both narrow and broad money, on the one hand, and inflation on the other was 0.99"
Narrow money means cash in circulation, but as King said, the relationship with cost-price inflation holds just the same for "broad money" (shown above) – meaning all notes & coins, cash on deposit, and short-term bills, notes and bonds. 0.99 is as near-perfect as you'll find in any pair of data. An absolute 1.00 only ever exists for the very same thing measured against itself – say, the cost of living mapped onto the cost of living, or Gold Prices correlated with Gold Prices , for example. Yet if we now race back to the present, and re-appoint Mervyn King for his second term running UK monetary policy, "the disruption to global financial markets has continued," explained the Bank of England – with King at the helm – when it cut UK rates on Thursday. "Credit conditions for households and businesses are tightening," the BoE explained. "Consumer spending growth appears to have eased...Output growth has moderated to around its historical average rate and business surveys suggest that further slowing is in prospect." In sum, "these developments pose downside risks to the outlook for inflation." Phew! And to think that five- and 10-year bond yields had finally shot higher just before the credit crunch bit in summer 2007 because inflation – whether in prices or the money supply – had finally became the No.1 worry for fixed-income investors. "...Underscoring inflation concerns, the benchmark 10-year US Treasury note last week had its biggest decline in price in more than two years, as investors abandoned projections the Fed would need to lower rates by year-end to stimulate growth," reported Bloomberg on June 11th. "...Mounting concerns about US inflation levels have sent short-term bond yields in Australia to their highest level since mid-2002," said Australasian Business Intelligence on June 20th. "...The global economy in 2007 is still expected to register close to 5% growth for the fourth year in a row," added Fidelity Investments on July 20th. "In response to this rapid growth, central banks around the world have continued to tighten their monetary policies, with the Eurozone, United Kingdom, Japan, China, and India all raising short-term rates." You might wonder – as we do here at BullionVault – whether that sudden surge in bond yields sparked the banking crisis of August. But either way, here in Feb. '08, "persistent fears over a possible US-led global slowdown [have] fuelled further profit taking in crude oil," as one London analyst told Agence France Presse at the start of this week. And here starts the chain of logic linking the housing slump to falling inflation, and by-passing the impact of monetary inflation altogether. "Between January 2003 and January 2008 alone," as the Financial Times quotes Goldman Sachs, "the world price of metals rose by 180% and of energy by 170%, in good part because of China 's demand." That demand, in its turn, came thanks to America 's credit-led bubble in consumer spending, but now the US consumer's tapped out – and his house-keys are back with the lender. So China can't grow, because the US can't shop. Therefore oil prices and base metals will sink, and inflation worldwide will now vanish. Who knows? Things might just pan out that way. But ignoring the flood of money – first created as credit and now stacked up in Treasury bonds across the emerging economies – would mean ignoring that perfect-as-damn-it connection between growth in the money supply and inflation in prices. The US money-supply – if the Fed still reported M3 – is now guess-timated to be showing 15% annual expansion. Remember, that near-perfect connection between money-supply growth and consumer-price inflation is one of the few clearly established facts in economics. Over a 30-year horizon, they match each other almost exactly. Which is to say they won't necessarily move together this week or next. Similarly, the last time runaway inflation hit, the cost of living for Western consumers raced ahead AFTER raw commodity prices had begun to slow down. During the inflationary '70s, the price of commodities – as measured by the Reuters/CRB Continuous Index – peaked out in Nov. 1980. For the next 21 years, it was then downhill all the way. Adjusted for inflation, however, the price of raw materials had in fact been falling since Feb. 1974. That was when the rate of US consumer-price inflation overtook growth in the CRB index, surging on the previous commodity-price hikes and feeding into service prices and wage demands. Inflation in the cost of living finally peaked out in April 1980, hitting an all-time record high of 14.7% year-on-year. How did consumer-price inflation keep soaring for more than five after commodity-price inflation began slowing? No doubt things really are different today, starting with the fact that the current bull market in commodity prices – beginning in 2002 – represents the only real secular bull run for raw materials since the Reuters/CRB index began in 1956. The 1973 doubling of commodity prices came thanks to the first Opec oil shock. Might the Federal Reserve be taking things a little too coolly – not least with the value of Dollars – by saying it "expects inflation to moderate in coming quarters" as it cuts the returns paid to Dollar holders? "The Opec [oil cartel] would trim output if oil prices slip to $80 per barrel," according to a Bloomberg report. It cites one un-named Opec delegate for the price target; two other members told the newswire that $70 would be "unacceptable". Says Johannes Benigni of JBC Energy in Vienna , "it wasn't Opec's fault it moved above $80, but now it's there, they justify keeping it." Then there's the pile of Dollars stashed away by the central bank in Beijing ...up from $156 billion at the start of 2000 to more than $1.5 trillion at last count. If the sorry demise of the US consumer really does dent the buying power of China , might the Chinese government not step in – and bid for crude oil, copper, soybeans and grain – to keep the fastest-growing economy growing just as fast as it can? Conjecture and guesswork is no substitute for an answer, of course. And for as long as Gold Prices keep screaming that something, somewhere is amiss between inflation and bond yields, then that dumb lump of metal might just keep finding a bid. Gold has now risen in 18 weeks of the last twenty-four. On Friday alone it hit new record highs against both Pounds Sterling and Euros. Still, nothing to worry about. The US recession is sure to send inflation to zero – just like it didn't in four of the last five recessions.